The Occupation of the Ruhr (German: Ruhrbesetzung) was a period of military occupation of the German Ruhr valley by France and Belgium between 11 January 1923 and 25 August 1925. The occupation was a response to the German Weimar Republic widely and regularly defaulting on reparation payments in the early 1920s. The total reparation sum of £6.6 billion had been dictated by the victorious powers in the Treaty of Versailles, and the reparation payments were due to last several decades. Military or belligerent occupation is effective provisional control by a certain ruling power over a territory, which is not under the formal sovereignty of that entity, without the violation of the actual sovereign. The territory is then known as the occupied territory and the ruling power the occupant. Occupation is distinguished from annexation by its intended temporary nature, by its military nature, and by citizenship rights of the controlling power not being conferred upon the subjugated population. The Ruhr is a polycentric urban area in North Rhine-Westphalia, Germany. With a population density of 2,800/km2 and a population of over 5 million (2017), it is the largest urban area in Germany and the third-largest in the European Union. It consists of several large cities bordered by the rivers Ruhr to the south, Rhine to the west, and Lippe to the north. In the southwest it borders the Bergisches Land. It is considered part of the larger Rhine-Ruhr metropolitan region of more than 12 million people, which is among the largest in Europe. The French Third Republic was the system of government adopted in France from 1870, when the Second French Empire collapsed during the Franco-Prussian War, until 10 July 1940 after France's defeat by Nazi Germany in World War II led to the formation of the Vichy government in France. The Allies of World War I or Entente Powers is the term commonly used for the coalition that opposed the Central Powers of Germany, Austria-Hungary, the Ottoman Empire and Bulgaria during the First World War (1914–1918). The Treaty of Versailles was the most important of the peace treaties that brought World War I to an end. The Treaty ended the state of war between Germany and the Allied Powers. It was signed on 28 June 1919 in Versailles, exactly five years after the assassination of Archduke Franz Ferdinand, which had directly led to World War I. The other Central Powers on the German side of World War I signed separate treaties. Although the armistice, signed on 11 November 1918, ended the actual fighting, it took six months of Allied negotiations at the Paris Peace Conference to conclude the peace treaty. The treaty was registered by the Secretariat of the League of Nations on 21 October 1919. Article 231, often known as the War Guilt Clause, was the opening article of the reparations section of the Treaty of Versailles, which ended the First World War between the German Empire and the Allied and Associated Powers. The article did not use the word "guilt" but it served as a legal basis to compel Germany to pay reparations for the war. By late 1922, the German defaults on payments had grown so regular that a crisis engulfed the Reparations Commission; the French and Belgian delegates urged occupying the Ruhr as a way of forcing Germany to pay more, while the British delegate urged a lowering of the payments. As a consequence of a German default on timber deliveries in December 1922, the Reparations Commission declared Germany in default, which led to the Franco-Belgian occupation of the Ruhr in January 1923. Particularly galling to the French was that the timber quota the Germans defaulted on was based on an assessment of their capacity the Germans made themselves and subsequently lowered. The Allies believed that the government of Chancellor Wilhelm Cuno had defaulted on the timber deliveries deliberately as a way of testing the will of the Allies to enforce the treaty. The entire conflict was further exacerbated by a German default on coal deliveries in early January 1923, which was the thirty-fourth coal default in the previous thirty-six months. Frustrated at Germany not paying reparations, Raymond Poincaré, the French Prime Minister, hoped for joint Anglo-French economic sanctions against Germany in 1922 and opposed military action. However, by December 1922 he saw coal for French steel production and payments in money as laid out in the Treaty of Versailles draining away. Wilhelm Carl Josef Cuno was a German businessman and politician who was the Chancellor of Germany from 1922 to 1923, for a total of 264 days. His tenure included the episode known as the Occupation of the Ruhr by French and Belgian troops and the period in which inflation in Germany accelerated notably, heading towards hyperinflation. Cuno was also general director of the Hapag shipping company. Raymond Nicolas Landry Poincaré was a French statesman who served three times as 58th Prime Minister of France, and as President of France from 1913 to 1920. He was a conservative leader, primarily committed to political and social stability. The French Prime Minister in the Fifth Republic is the head of government. During the Third and Fourth Republics, the head of government position was called President of the Council of Ministers, generally shortened to President of the Council. An invasion is a military offensive in which large parts of combatants of one geopolitical entity aggressively enter territory controlled by another such entity, generally with the objective of either conquering; liberating or re-establishing control or authority over a territory; forcing the partition of a country; altering the established government or gaining concessions from said government; or a combination thereof. An invasion can be the cause of a war, be a part of a larger strategy to end a war, or it can constitute an entire war in itself. Due to the large scale of the operations associated with invasions, they are usually strategic in planning and execution. Coal is a combustible black or brownish-black sedimentary rock, formed as rock strata called coal seams. Coal is mostly carbon with variable amounts of other elements; chiefly hydrogen, sulfur, oxygen, and nitrogen. Coal is formed if dead plant matter decays into peat and over millions of years the heat and pressure of deep burial converts the peat into coal. 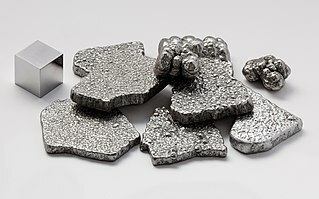 Iron is a chemical element with symbol Fe and atomic number 26. It is a metal in the first transition series. It is by mass the most common element on Earth, forming much of Earth's outer and inner core. It is the fourth most common element in the Earth's crust. Its abundance in rocky planets like Earth is due to its abundant production by fusion in high-mass stars, where it is the last element to be produced with release of energy before the violent collapse of a supernova, which scatters the iron into space. Though the French succeeded in making their occupation of the Ruhr pay, the Germans through their passive resistance in the Ruhr and the hyperinflation that wrecked their economy, won the world's sympathy, and under heavy Anglo-American financial pressure (the simultaneous decline in the value of the franc made the French very open to pressure from Wall Street and the City), the French were forced to agree to the Dawes Plan of April 1924, which substantially lowered German reparations payments. Under the Dawes Plan, Germany paid only 1 billion marks in 1924, and then increasing amounts for the next three years, until the total rose to 2.25 billion marks by 1927. To deal with the implementation of the Dawes Plan, a conference took place in London in July–August 1924. The British Labour Prime Minister Ramsay MacDonald, who viewed reparations as impossible to pay, successfully pressured the French Premier Édouard Herriot into a whole series of concessions to Germany. The British diplomat Sir Eric Phipps commented that "The London Conference was for the French 'man in the street' one long Calvary as he saw M. Herriot abandoning one by one the cherished possessions of French preponderance on the Reparations Commission, the right of sanctions in the event of German default, the economic occupation of the Ruhr, the French-Belgian railroad Régie, and finally, the military occupation of the Ruhr within a year". The Dawes Plan was significant in European history as it marked the first time that Germany had succeeded in defying Versailles, and revised an aspect of the treaty in its favour. The Saar region remained under French control until 1935. World War I reparations were war reparations imposed during the Paris Peace Conference upon the Central Powers following their defeat in the First World War by the Allied and Associate Powers. Each of the defeated powers was required to make payments in either cash or kind. Because of the financial situation Austria, Hungary, and Turkey found themselves in after the war, few to no reparations were paid and the requirements for reparations were cancelled. Bulgaria, having paid only a fraction of what was required, saw its reparation figure reduced and then cancelled. Historians have recognized the German requirement to pay reparations as the "chief battleground of the post-war era" and "the focus of the power struggle between France and Germany over whether the Versailles Treaty was to be enforced or revised". Gustav Ernst Stresemann was a German statesman who served as Chancellor in 1923 and Foreign Minister 1923–1929, during the Weimar Republic. He was co-laureate of the Nobel Peace Prize in 1926. The Locarno Treaties were seven agreements negotiated at Locarno, Switzerland, on 5–16 October 1925 and formally signed in London on 1 December, in which the First World War Western European Allied powers and the new states of Central and Eastern Europe sought to secure the post-war territorial settlement, and return normalizing relations with defeated Germany. It also stated that Germany would never go to war with the other countries. Locarno divided borders in Europe into two categories: western, which were guaranteed by Locarno treaties, and eastern borders of Germany with Poland, which were open for revision. War reparations are compensation payments made after a war by the vanquished to the victors. 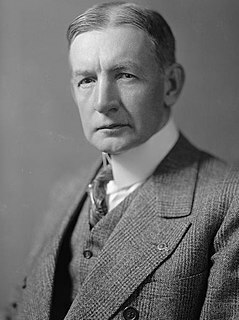 The Dawes Plan was a plan in 1924 to resolve the World War I reparations that Germany had to pay, that had strained diplomacy following World War I and the Treaty of Versailles. The Young Plan was a program for settling Germany's World War I reparations written in August 1929 and formally adopted in 1930. It was presented by the committee headed (1929–30) by American industrialist Owen D. Young, creator and ex-first chairman of the Radio Corporation of America (RCA), who, at the time, concurrently served on the board of trustees of the Rockefeller Foundation, and also had been one of the representatives involved in a previous war-reparations restructuring arrangement—the Dawes Plan of 1924. The Inter-Allied Reparations Commission established the German reparation sum at a theoretical total of 132 billion, but a practical total of 50 billion gold marks. After the Dawes Plan was put into operation in 1924, it became apparent that Germany would not willingly meet the annual payments over an indefinite period of time. The Young Plan reduced further payments by about 20 percent. Although the theoretical total was 112 billion Gold Marks, equivalent to US ca. $27 billion in 1929 over a period of 58 years, which would end in 1988, few expected the plan to last for much more than a decade. In addition, the Young Plan divided the annual payment, set at two billion Gold Marks, US $473 million, into two components: one unconditional part, equal to one third of the sum, and a postponable part, equal to the remaining two-thirds, which would incur interest and be financed by a consortium of American investment banks coordinated by J.P. Morgan & Co. The Rentenmark was a currency issued on 15 November 1923 to stop the hyperinflation of 1922 and 1923 in Weimar Germany, after the previously used "paper" Mark had become almost worthless. The name literally meant "pension mark", in order to signal that pensions were secure. It was subdivided into 100 Rentenpfennig and was expanded in 1924 by the Reichsmark. The following lists events that happened during 1924 in the Weimar Republic. The Genoa Economic and Financial Conference was a formal conclave of 34 nations held in Genoa, Italy from 10 April to 19 May 1922. It was planned by British prime minister David Lloyd George to resolve the major economic and political issues facing Europe, and to deal with the pariah nations of Germany and Russia, both of which had been excluded from the Paris Peace Conference of 1919. The conference was particularly interested in developing a strategy to rebuild defeated Germany, as well as central and eastern Europe, and to negotiate a relationship between European capitalist economies and the new Bolshevik regime in Soviet Russia. However Russia and Germany signed a separate agreement at Rapallo and the result at Genoa was a fiasco with few positive results. The conference did come up with a proposal for resuming the gold standard that was largely put in place by major countries. The Spa Conference was a meeting between the Supreme War Council and the government of the Weimar Republic in Spa, Belgium on 5–16 July 1920. 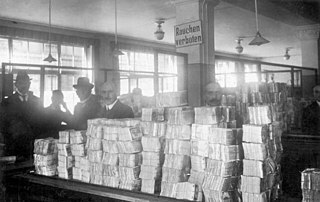 Hyperinflation affected the German Papiermark, the currency of the Weimar Republic, between 1921 and 1923. It caused considerable internal political instability in the country, the occupation of the Ruhr by France and Belgium as well as misery for the general populace. The Inter-Allied Rhineland High Commission was created by the Treaty of Versailles on 28 June 1919, to supervise the occupation of the Rhineland and "ensure, by any means, the security and satisfaction of all the needs of the Armies of Occupation". It came into being on 10 January 1920, when the treaty came into force. It was based in Coblenz. The Lipetsk fighter-pilot school was a secret training school for fighter pilots operated by the German Reichswehr at Lipetsk, Soviet Union, because Germany was prohibited by the Treaty of Versailles from operating an air force, and had to find alternative means to continue training and development for the future Luftwaffe. Today it is the site of Lipetsk Air Base. The Cuno cabinet was the seventh democratically elected Reichsregierung of the German Reich, during the period in which it is now usually referred to as the Weimar Republic. The cabinet was named after Reichskanzler (chancellor) Wilhelm Cuno and took office on 22 November 1922 when it replaced the Second Wirth cabinet under Joseph Wirth. The Cuno cabinet was forced to resign on 12 August 1923 and was replaced the next day by the first cabinet of Gustav Stresemann. The Ruhr Question was a political topos put on the agenda by the Allies of World War I and the Allies of World War II in the negotiations following each respective war, concerning how to deal with the economic and technological potential of the area where the Rhine and Ruhr intersect. France was heavily in favor of monitoring this region, due to the perception that the economic and technological potential of the region had allowed the German Reich to threaten and occupy France during the Franco-Prussian War, World War I, and World War II. The Ruhr question was intimately associated with the Saar Statute and the German Question. There was also a close relationship between the Ruhr Question and the Allied occupation of the Rhineland (1919-1930), the Occupation of the Ruhr, the founding of the state of North Rhine-Westphalia (1946), the Monnet Plan (1946-1950), the Marshall Plan (1948-1952), the International Authority for the Ruhr (1949-1952), the Schuman Declaration (1950), and the founding of the European Coal and Steel Community (1951). The political treatment of the Ruhr question is known as Ruhrpolitik in German. When one looks at the Rhineland as a whole or the attempted establishment of the Rhenish Republic in 1923, the terms Rhein- und Ruhrfrage or Rhein-Ruhr-Frage are used in German. ↑ Timothy W. Guinnane (January 2004). "Vergangenheitsbewältigung: the 1953 London Debt Agreement" (PDF). Center Discussion Paper no. 880. Economic Growth Center, Yale University. Retrieved 6 December 2008. ↑ The extent to which payment defaults were genuine or artificial is controversial, see World War I reparations. 1 2 Marks, p. 240. 1 2 Marks, p. 245. 1 2 Marks, pp. 244–245. ↑ Mordacq, Henri. Die deutsche Mentalitat. Funf Jahre B. am Rhein. p. 165. ↑ John Maynard Keynes, The economic consequences of the Peace. ↑ "Declaration of 9 may - Robert Schuman Foundation". www.robert-schuman.eu. Retrieved 2019-01-11. ↑ "WHKMLA : The French Occupation of the Rhineland, 1918-1930". www.zum.de. Retrieved 2019-01-11. ↑ Sally Marks, '1918 and After. The Postwar Era', in Gordon Martel (ed. ), The Origins of the Second World War Reconsidered. Second Edition (London: Routledge, 1999), p. 26. ↑ Marks, p. 35, no. 57. ↑ Hines H. Hall, III, "Poincare and Interwar Foreign Policy: 'L'Oublie de la Diplomatie' in Anglo-French Relations, 1922–1924," Proceedings of the Western Society for French History (1982), Vol. 10, pp. 485–494. ↑ Aude Dupré de Boulois, "Les Travaillistes, la France et la Question Allemande (1922–1924)," Revue d'Histoire Diplomatique (1999) 113 No. 1 pp. 75–100. 1 2 Marks, p. 248. ↑ James M. Diehl, "Von Der 'Vaterlandspartei' zur 'Nationalen Revolution': Die 'Vereinigten Vaterländischen Verbände Deutschlands (VVVD)' 1922–1932," [From "party for the fatherland" to "national revolution": the United Fatherland Associations of Germany (VVVD), 1922–32] Vierteljahrshefte für Zeitgeschichte (October 1985) 33 No. 4 pp. 617–639. Marks, Sally. "The Myths of Reparations," Central European History, Volume 11, Issue No. 3, September 1978 pp. 231–255. O'Riordan, Elspeth Y. "British Policy and the Ruhr Crisis 1922–24," Diplomacy & Statecraft (2004) 15 No. 2 pp. 221–251. Occupation after the War (France and Belgium) at 1914-1918 Online: International Encyclopedia of the First World War. Ruhr Occupation at 1914-1918 Online: International Encyclopedia of the First World War.